Oscar Parkes OBE MB Ch B (1885-1958). (attributed). Watercolour. Undated. Attribution of this watercolour - and many very similar ones that have surfaced at auction houses recently, all unsigned - has variously been given to Lt Col Harold Wyllie, Commander Eric Tufnell; W A Richards; and Oscar Parkes. Eric Tufnell they are certainly not as the style is so very different, the seas painted very differently, superstructures and fittings in a dissimilar way; and I am very uncertain about Harold Wyllie being the artist as his signed watercolours are generally softer of line and with less attention paid to the fine points of such details as rigging, wireless aerials and boat davits and fittings. To a degree these paintings fit W A Richards' manner of painting, the colours being bright and with plenty of contrast, the seas being crisp and "wet". But top of the list of probable artists is, I believe, Dr Oscar Parkes whose signed works are indeed notable for their crisp, wet seas, close attention to technical fittings and lines of structure and his habit of highlighting shine on the leading edge of such fittings as masts, davits and guard rail stanchions. Parkes was, of course, editor of Jane's Fighting Ships for a period between the wars and several editions of those publications and his other, simpler and smaller reference books, "Ships of the Royal Navy", carry illustrations by him, often unsigned and generally of ships that were laid down but not yet completed. As he himself writes in the Forward to Ships of the Royal Navy (c.1922 - when he had become Editor of Jane's - "By the courtesy of the Directors of Naval Construction and Naval Intelligence I have been enabled to prepare and include sketches of these [new construction] ships as they will appear....". 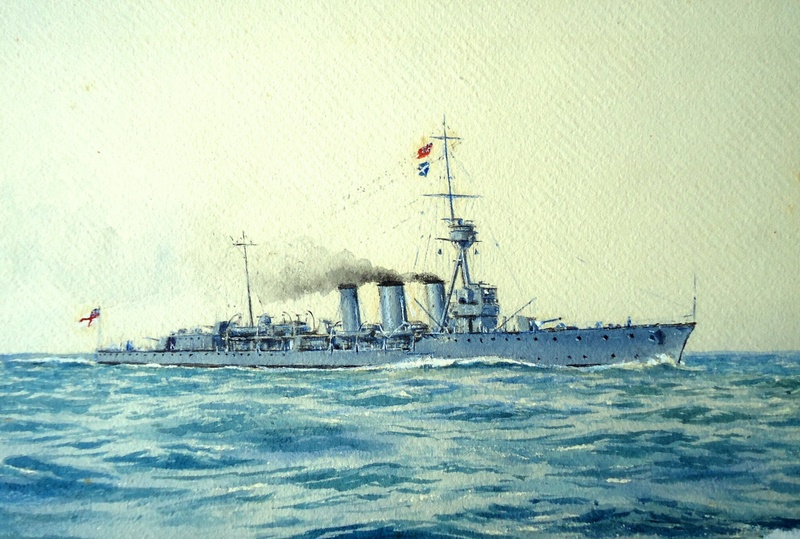 His publications required an endless supply of photographs or other images and very often he himself painted watercolours of the ships he would describe in his reference works. He was an accomplished artist and we read that he loved painting. so much so that when he published in late 1939/1940 in conjunction with the Illustrated London News "British Warships, the Royal Navy Completely Illustrated and Described", a fair few of the illustrations were paintings by him and were of ships in commission and of which there were many photographs available: he clearly preferred to use his own - very competently executed - paintings! I therefore conclude that there are strong grounds for believing that it is he who is the artist of this and many other very similar, but also unsigned, watercolours. The draftsmanship in all is quite excellent and the detail superb: and they all seem to have been painted on the same type of paper, Not (Cold Pressed) paper which further supports this contention.